DS quarterback Kirby Ryan (15) pitches the ball to Tylan Mendes on a toss play late in the third quarter. 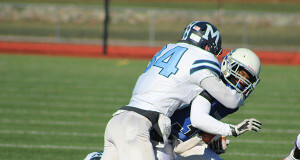 Medfield’s Colby Gonser (34) grabs hold of DS running back Tylan Mendes with Camron Giunta (33) closing in for support. Two arch enemies met on the gridiron for their annual Turkey Day battle on Thursday as the Dover-Sherborn Raiders hosted the Medfield Warriors. When the dust settled from the scrappy and hard-hitting affair, DS came away with the 17-0 victory to finish the season with an impressive 7-4 record - but it did not come easy. Following a scoreless first quarter, senior running back Tylan Mendes drew first blood for DS with a 12-yard touchdown run to give the Raiders a 6-0 lead with 10:22 to play in the first half (PAT blocked). 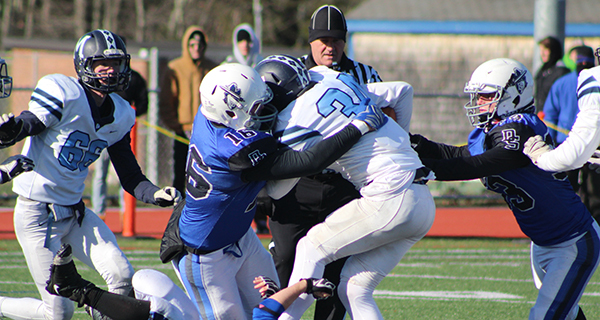 After forcing consecutive Medfield punts, DS struck again with 1:53 remaining in the half when junior quarterback Kirby Ryan hooked up with Matt Paolatto for a long touchdown strike to extend the Raiders lead to 12-0 (two-point try unsuccessful). DS got the ball back with under a minute to play in the half after forcing a three-and-out. Kirby Ryan moved the Raiders down into field goal position and Drew Dummer hammered home a 27-yarder with eight seconds remaining in the quarter to give DS a 15-0 lead at halftime. Defense completely dominated the second half for both teams. The Ryan Murray-led offense of Medfield threw everything but the kitchen sink at DS to try and make it a one-score game and climb back into the contest, but the Raiders stood tall as DS took their 15-point cushion into the fourth. Dover-Sherborn’s James Wirth (16), Leo Jalali (77) and Martin Brault (53) gang-tackle Medfield’s Colby Gonser. With time winding down and Medfield pinned deep in their own territory, DS added to their lead, thanks to a high snap over the head of Murray, who recovered the ball in his own end zone before being tackled for a safety. The play gave DS a three-score lead at 17-0 with 2:05 to play, sealing the deal. The Raiders preserved the shutout and held on for the 17-point win. DS’s Tylan Mendes (offensive) and Martin Brault (defensive) were awarded the game’s MVP awards.